The title of this blog's been edited a couple of times since I thought of writing it the other day. First it was simply Next project , then I realised I needed to be more specific than that, as I have several projects going on in parallel, but will try to stick to just one at a time involving yarn, thread, fabric, or other textile related materials. These cameras need a bag! Ian has bought a new camera* and rather than let him spend even more money on a decent bag, I offered to make him one. Somewhat reluctantly, I must put aside the knooking hook and turn to my neglected sewing machine. The bag needs to take the old and new cameras, as well as one spare lens. Fitting these together, I need to add one extra small pocket if I'm to make an sensible-shaped bag, so there'll be four pockets. I have this gorgeous green fabric - I'd like to call it baize, but I'm not sure if that's what it actually is - felt, maybe? - in the cupboard, which I think will make a rather fine lining, and some sturdy denim for the outside. In between the two it will need some substantial padding, so I'm planning to sacrifice an old cushion, and perhaps a flat pillow, too, if necessary. I did start on this project, by consulting with the client - Tell me what you want now, because otherwise I'll make it and then you'll complain that it's wrong. - and lots of measuring and laying out. I'm starting with the four lining pockets and working outwards from there. Having sketched out the first bit on the back of an envelope, I looked at the fabric and realised that there is a point to patterns (I'm not generally a fan, as you may have gathered from my baby blanket) - the scope for error is just too great without a pattern. Pinning pattern pieces onto the lining fabric. Pebble is helpful as ever. ... and marked all the corners with tailor's tacks. At this point, another, more urgent, project came up. Yes, that's right, an urgent needlework project. It involves knooking, and even better, I have to make new knooking hooks - two of them! More than that, I cannot tell you at this point. This means that the camera bag is the next but one project, as I couldn't have two projects running in parallel, could I? *I know that doesn't sound very consistent with our low-cost lifestyle, but it's for work and, having seen the photos, I have to admit it does make a big difference to his photography. I've been thinking hard about the tomato question since yesterday. Berti (and other friends) suggested growing them on a bit and selling them. This sounds like good sense - a little bit of pocket money as a byproduct of what I'm doing anyway - but is it really? Of the saved seeds, I've already pricked out 57 seedlings. I want 20ish, so there are plenty for me, for backup to replace the ones that die, and to swap with friends. The question is what to do with the hundred still in the seed tray, that are now looking a bit cramped. If I want to sell them, I'll have to spend a couple of hours pricking them out and setting out a stall at the end of the driveway... actually, if I've got to find a table, materials, make up a sign, etc. that's probably more like three hours (not counting the time needed to go and buy more pots). A neighbour where we used to live sold small plants for 30p each, so I'll take that as the price. I could get more if they were bigger, but then they'd be taking up space for longer. Even so, they'd clog up the greenhouse for a while until they were big enough to sell. I'd also have to buy pots - which are 12p each for the smallest ones - and compost, for which I can't be bothered to calculate the price. Let's say I'm spending 15p per pot and selling for 30p. In the unlikely event that I manage to sell all hundred of them, I'd make £15 for three hours work, or £5 per hour. £5/hr is not a stupidly low return on my time - roughly the minimum wage for 18-20 yr-olds - but it's not very much. Do I want to do that kind of work for that rate of return? It's not as if I'm sitting around twiddling my thumbs here. I always have a long list of jobs and projects ahead of me - which somehow always seems to include 'washing up'! I have to come back to the fact that the point of the new lifestyle is not to earn money, but to produce as much as possible of what we need directly. If I was going to get a much higher return on my efforts I might think selling things was worthwhile, but £5/hr is not enough to tempt me away from the path I've chosen to follow. A hundred baby tomato plants are destined for the compost heap. The lovely Gingerbread Lady has presented me with an award! Isn't that nice? If you've come over here from there, welcome! Do have a look around :-) Oh, you already have, or you wouldn't have made it to this post. Well... thanks! The idea is that I now pass it on to 3-5 of my favourite blogs, who have fewer than 100 followers. I'd like to send it straight back, because I really enjoy reading Gingerbread Lady's blog, but since getting the award she now has over 100 followers, so is no longer eligible. So I'll just have to find a few more favourite blogs - oh the hardship! First up is Susie at Useless Beauty. I did wonder whether to include Susie, as she was on Gingerbread Lady's list and also one of the other recipients chose her, so this'll be at least the third time she receives this award. On the other hand, I really do love her blog, so sod it! Useless Beauty is in! (I don't think this means you have to choose three times as many blogs to pass it on to, though, Susie ;) She writes about sewing, crochet and knitting quite a lot, but also life in general and can be very funny. Next is Louisa at The Really Good Life. She may have more than 100 followers - she doesn't brag about it. Anyway, I like her practical gardening blog. She writes about other things too - cooking, making things, finding cheaper and less 'manufactured' ways of doing things - all sorts of things that I'm interested in, too. Finally (and I think I'll stop at three - I'm mathematically minded enough to see how this could spiral out of control! ), another good life blog I enjoy is Red's Colour it Green, which has the added bonus of a link to her main website, which is a repository of all kinds of useful information. She may also have more followers and keep quiet about it, but I'll take a chance - I like the blog. I love reading other people's blogs - reading about people who are taking the same journey that we are; people who have travelled a lot further along that route and can offer the benefit of their experience; and people who are far more expert than me in some aspect and offer inspiration, as well as words of encouragement and comfort, as appropriate. What am I going to do with all these tomatoes? I've lost track track of when I last wrote about seed planting, if indeed I have at all. Suffice to say that some seeds have been planted. Aubergine, gherkin and chilli seeds in a tray. Small quantities of each as they were freebies, but that's fine; I think one of each would probably be enough. New greenhouse thermometer. As you can see, it's been pretty warm in there these last few days. ... jamming kettles, kilner (-type) jars, knitting yarn, and shoes. I'm not so sure about the shoes, but I haven't actually ventured into that part of the shop yet. Charlie's is my favourite shop, ever. But I digress. The other problem with planting peas directly outside is mice. Everyone tells me this and although I've taken my dad's advice and covered them liberally with holly leaves, I'm still worried the mice might 'ave 'em. So... I've planted a batch in the greenhouse, too, in funky little newspaper pots that seem to be all the rage on environmentally friendly gardening blogs. The first 40 newspaper seedling pots. I need several hundred. We'll just have to see what survives. Potatoes, all nicely chitted and ready for planting. I got a bit confused about numbers of potatoes. Originally I guestimated that we'd need 100 plants (say one plant gives a meal's worth of spuds, that's two meals-worth per week for the year), but then I used JBA's potato calculator, which told me I only had space for 50... but I've just planted 100. I'm not sure how that happened. I may have planted them far too close together, but how did I end up ordering twice as much as I thought I had space for? It's a mystery. The onion seeds I sowed back in January are coming along well. Tomato and onion seedlings. Some of the tomatoes are in egg boxes because I ran out of plastic module trays and hadn't yet thought of the newspaper pots. I had three types of tomato seeds, none of which I bought. Two were freebies with Grow It magazine, of which I was particularly pleased with Roma, that are good for sauces and bottling. The third were my saved seeds from cherry tomatoes I bought for eating. These are an unknown quantity, as they could well be hybrids and grow quite different fruit from the parent plant. Guess which ones are in the photo? Yes, the unknown, saved seeds were the ones that germinated quickly and prolifically. I sowed two batches of each, a few weeks apart. I have pricked out 57 of the first batch of saved tomatoes and have another hundred seedlings in a tray. Of the free seeds, two or three of the Roma and one of the other (Tamina) have germinated from the first batch, with 30 Roma and about 10 Tamina germinating from the second batch. In total, then, I have about 200 tomato seedlings. I really don't know how many tomato plants I'm going to need, and they take up quite a lot of space. Articles on the subject tend to say, "Five or six plants are usually enough for an average family." This isn't very helpful. A bit more research reveals that an average sort of a yield for a tomato plant might be 8-10 lb. This is much more useful information. For Roma, which will be mostly bottled (tinned, but in glass not tin), I can estimate how many bottles I'll need: If each one takes 1 lb fruit (similar to a tin) and I use two tins bottles per week, that's about 100 lb fruit, so twelve plants. I'll probably use more than that - make it twenty plants, which was my original estimate. The others are more difficult to calculate, but for simplicity I could go for similar numbers of each, making 60 in total. That's a hell of a lot of tomato plants to find space for, but still leaves me with over 100 seedlings that I have no use for, and mostly very little idea of what kind of fruit they'll bear. Several thousand tiny thyme seedlings. The indentation is a paw print - punishment for putting seed trays all over the sunny windowsill. It's coming up to the end of Earth Hour and I've been watching my electricity monitor for most of it. This is possible because I have the lights on. About ten minutes in, the fridge happened to turn itself off, so the only things we had switched on were the lights. The other 'background' consumption, the heating, is off, mainly because it's broken. The monitor fluctuated between 19 and 27 Watts, which is not bad for four 7W bulbs. Then the fridge kicked in and the usaged jumped to around 160 Watts for the fifteen minutes until it switched itself off again. During that time, we both turned our laptops on - not a flicker on the monitor, in spite of the fact they're both plugged into the mains. If anything, the consumption dropped. Now, as the hour comes to an end, we have both computers and four lightbulbs on, and the monitor is again fluctuating between 19 and 25 Watts. I have very mixed feelings about Earth Hour. As you can tell from the above, we did not yield to WWF's exhortation to Switch off your lights to show you care about climate change and protecting the natural world. Is that because we don't care? No, of course not. It's because switching the lights off is purely a gesture - the lights evidently use much less power than the fridge; how many people switched their fridges off? - and I'm really not sure of the value of gestures. Switching lights off is very visible, especially in cities (not sure anyone would notice the difference out here in rural Wales), so it's certainly an attention-grabbing gesture. Having grabbed the attention, what message does this gesture convey? I find this question very difficult to answer. I guess the most positive possibility is that a lot of people think, We need to reduce our electricity consumption to save the Earth. I nearly wrote power instead of electricity but I think that would be over optimistic. The lightbulb is quintessentially electric; I'd be very surprised if the concept of saving power by switching them off would generalise to other forms of power. This is unfortunate, because electricity is only a medium for transporting power; its generation can come from the dirtiest of fossil fuels or the cleanest of renewables. I don't believe that targetting electricity per se is necessarily helpful. More specific messages might be even less helpful. 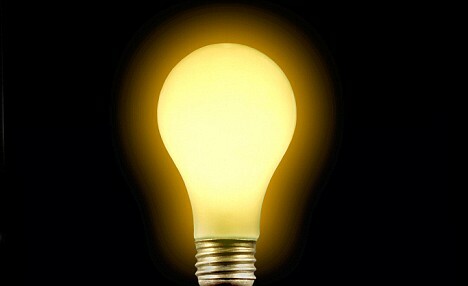 It's likely that focusing on light gives people the impression that lights are a relatively big consumer of electricity. If I'm to believe my electicity monitor (and I'm still not sure I entirely trust it), lights, especially modern low-powered bulbs, use relatively little power. This could easily distract people from the big energy users, and leave them thinking that regularly turning lights off will make a useful impact on their energy consumption. As for the actual impact of Earth Hour on electricity consumption, I'd be surprised if much of the reduction was any more than displacement. For example, you could not boil a kettle during that hour by having your cup of tea either before or afterwards. You could delay putting the dishwasher on for an hour. No doubt some people charged batteries beforehand so they could use electrical devices without plugging them in during that hour. As for carbon dioxide emissions, the effect of Earth Hour could have been to actually increase them. A friend mentioned that she was planning to use a paraffin lamp instead of electric lights, prompting me to search out this report. To save you having to read it all, I'll tell you that the interesting comparisons are found in graphs on pages 10 and 12. The first of these tells me that a pressurised paraffin lamp emits somewhat more light than an electric bulb; 180 Lux for the lamp vs. 120ish Lux for either a 15W compact fluorescent or the 60W incandescent bulb (it doesn't seem a fair comparison to look at the much more feeble hurricane lamp). However, the difference in CO2 emissions is far greater; 260 kg/year for the lamp vs. 80 for the incandescent bulb and only 20 for the modern, low power bulb (OK, it may not be fair, but the hurricane lamp still has higher emissions than either of the lightbulbs, in spite of much lower light output). Earth Hour: A grand gesture that focuses a lot of attention on the issue, may distract from higher impact ways of reducing CO2 emissions, and might have increased emissions during the hour itself. No, we're not turning off the lights for Earth Hour. In spite of the title, I'm going to backtrack a little to start with. Last time I wrote about knooking, I was just about to try combining crochet with knitting. So how do did I get on? Finally, I decided to add some crochet decoration to a knitted square, which I suspect is quite common practice amongst people who've never even heard of knooking, but I used the knooking hook throughout. Balloons, or are they weeds? My original idea was for a bunch of balloons, but when I showed it to Ian, he said, "Oh, I thought they were weeds." Weeds? OK, maybe they don't look very balloon-y. I'll settle for flowers, then. You may notice that many, if not all, of these squares are not actually square. In fact, it's possible that no two are exactly the same shape. Fitting them together could be a challenge. But never fear - I had a plan! Using funky coloured tapestry wools found under sundry embroidery, darning, and other threads (mostly inherited), I would construct small sections of fabric to fill the awkward gaps. The putting together of this blanket involved much rearrangement of squares, ponderous looking at it and going, "Hmmm." Pebble helped. Pebble helping with the construction of the baby blanket. It was all going so well, right up to the end, which is where the yellow square with weeds meets the pink one at the edge - as if you couldn't tell where the problem is! I really should have unpicked the last bit and done it again. I nearly did. The only thing that stopped me was the nagging feeling that I'd probably introduce another problem, just as bad. Instead, I put it in the washing machine - mainly to check that it is indeed machine washable, as it's pretty useless to my sister if it's not - and tried to persuade it to be a bit flatter as it dried. That didn't make a huge amount of difference, so the finished baby blanket is not entirely blanket shaped. I'm more worried that the tapestry wool sections will be too scratchy for the baby. The rest is lovely soft fluffy baby wool (most of which is not wool at all) but those bits are actual wool and the contrast in textures is striking. I do hope it's usable and the baby likes it, but if not, I don't suppose my sister will be too disappointed. I don't think she really expected me to finish it anyway. I've been wanting to write this post for so long - I keep thinking I'm nearly there and I'll be able to tell you I've finished by the end of the day and then realising just how much is left. The day after I wrote my last post on the subject it all got too much for me. I did an hour or so in the morning, then sat down with a cup of tea and nearly fell asleep in my chair - the chair in question being outdoors, in early March. On closer examination, this turned out to be three plants, closely entwined. I split them up and replanted them, then had another good, long break. The pyracantha I was promising to move in the last post finally got tackled just the other day. It was a predictably tough job, the roots being extensive, in rocks, and very close friends with a tree root, and that's before taking account of the thorns. ...and here's the hole it came out of. Yes, I know holes in the ground don't make for great photos, but it was a big hole, OK? Whilst looking up the spelling of pyracantha, I learnt that the berries are edible as well as pretty, so it may yet earn its keep. This is all probably very boring, but I've done a huge amount of work and I'm feeling rather pleased with myself. If I can't brag a little on my own blog, what's the point of writing it? Today, I finally finished digging over the garden. Even as I write this, I know it's not entirely true. There's still the Virginia creeper by the house to dig up and make way for tomatoes (though they could go in the conservatory instead), and I haven't done the strip along the fence for (yet more) sunflowers, but that's outside the fence, so that doesn't count. The third and final laburnam is still there, too, but I've decided to leave that until next year, mainly because it's surrounded by bluebells at the moment. Today I finished digging over all of the existing beds in the enclosed garden. Sturdy wall to stand on, at the edge of the conservatory roof. As you can see, the hillside goes right along the top of the conservatory, so I can get to a good vantage point on the roof. Compost heap with fork, for scale. Tomorrow I'll tell you about seeds, or knooking, or possibly both, but for now, I shall enjoy feeling a little smug. Whilst hanging out on some bushcraft forum or other, way back last summer when I was still just dreaming of the new life, I learnt about tapping birch trees for sap. I'd already heard of tapping trees - that's the way maple syrup is made - but this brought it closer to home and made it seem like a realistic possibility. I read descriptions, watched Youtube videos and generally got quite excited about the idea. ...and nothing. Not even a drop. I wondered whether I hadn't pushed the knife in far enough, or perhaps it was too early in the year, or maybe I was trying the wrong kind of tree. In spite of the convenience of being in my garden, the tree in question didn't have a lot to recommend it as actually being a birch tree. (Note that in my excitement at it being early March, I didn't actually bother to watch the video again, with its helpful advice on identifying birch trees when they have no leaves on). Considering the last possibility, I set off into the nearby woods in search of a more likely looking tree. Finding one that presented itself more convincingly as birch, I stuck the knife into it... and was immediately rewarded with a gleaming drop of sap! But that was it. One drop was about all that came out. Oh well, at least I'd accomplished the first step - find the right tree. I decided to leave it a while to see whether I'd have any more luck later in March. So it was that yesterday I set off into the woods again armed with knife, pointy stick and bottle. This time was much more successful - when I stuck the knife in, sap came out of the tree and kept coming. I didn't exactly pour out, but there was a distinct trickle, as in the video. The next challenge was making the sap run along the pointy stick, instead of straight down the tree. Even in the demonstration video on Youtube it took a few attempts, so I knew this wasn't going to be easy, and it wasn't. Still, out of maybe half a dozen attempts on three different trees, I managed to get one (not the last one) to work. Drips formed and fell from the end of the pointy stick - more success! ...and waited. The sap was coming at a rate of about one drip every five seconds to start with, but when I checked back half an hour later (after trying other trees) it had slowed to one every twelve seconds or so. I decided to leave it and collect it later. It wasn't exactly discreet, being right next to the footpath and at eye level, but I don't think I've seen another person in those woods since we moved, so I thought I'd chance it. What would it matter if someone did see it, anyway? Glass of birch sap, with cat's paw for scale. It's not just because she walked in front of the camera, honest. That glass of sap is all I got. That's not a wine glass, it's a sherry glass, or possibly port. I'm not sure, but it's small. If I'd been dying of thirst I'd have been glad of it, but then if I'd been dying of thirst in those woods I'd have been up for a Darwin award, for not following the sound of water to the stream in the valley. It tasted nice - bright, fresh and springlike is the best way I can describe it. Not terribly sweet, though. I had optimistically hoped to get enough to make a bottle of wine from, but I doubt there'd be enough sugar in it for that. Similarly, people do boil it down to make syrup, as with maple syrup, but that seemed equally unlikely. In spite of the very small quantity, I'd still say it was a successful experiment - though perhaps not successful enough to bother repeating. It was an entertaining way to spend an hour or so, anyway. Grated soap. Please ignore the state of my cooker. I started by grating a bar of homemade soap (plus that leftover bit of Imperial Leather) and added hot water while I considered quantities. Both recipes call for roughly equal amounts of soap and soda, though expressed differently. I decided to match by weight, as that'll be easier to replicate if I do it again. The first step, then, was to weigh my other bars of soap to find out how much I'd just used. It was about two and half ounces, so I weighed out that quantity of soda crystals. I then moved on to water - i.e. how concentrated do I want this? Comparing the two recipes, one suggests using four times as much soap/soda as the other per wash. Clearly, this isn't an exact science. If I take the average, that's recipe #5, but use one cup per load. Now, I'm used to using a concentrated liquid, so I'd like to end up with something similar. More to the point, I'd like to be able to fit it in the bottle - even scaled down, this recipe makes over a gallon! So... I've scaled down the recipe to half, as that's how much soap I grated. That would give me 1.25 gallons, with instructions to use one cupful per load. One cupful is quite a lot - 240 ml, whereas the concentrated stuff I buy uses 35 ml per load. If I want to stick with the same cap measure, I need to reduce the total quantity by that ratio, so ten pints (1.25 gallons) x 35/240 = 1.46 pints. Hmm, how much did I put in the saucepan again? I hadn't actually measured how much water I put in at the beginning (my excuse is that I thought I'd be adding more to it, and measuring the total). I took another saucepan of similar size and poured two pints of water into it. They looked about the same volume, maybe a bit less in the soapy one, so one and a half pints probably wasn't far off. With the occasional stir between calculations, the soap had all dissolved (that's probably not technically correct, but I can't think of the right word) into the water, so I stirred in the soda crystals, mixed, and left it to cool. I was a bit concerned by the recipe note that it will gel. Having made it so much more concentrated, would it set solid? By the time it was lukewarm it still looked like milk, and I couldn't be bothered to wait any longer. I poured it into the old bottle, and most of it went in. There was about 100 ml over, which I put straight into the little ball for washing and put a load on. That's about three times as much as I'm expecting to use normally, but what else was I going to do with it? Note the bird feeder still on the line - perhaps not the best combination. The washing looks and smells clean, at least with that quantity. After a night in the cold (the washing machine lives in the conservatory), the liquid had set solid, with an unattractive crust of suds on the top. I stirred it with a skewer and it turned into a gloopy liquid, just like the bought stuff, though not as smooth. I can live with lumpy laundry liquid - if it's effective it'll save us a fortune! OK, not a fortune - we never spent that much on laundry, but really, this homemade stuff is very cheap. Sod. Now I've said that, I'm going to have to work out just how cheap it is. 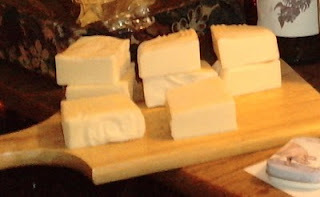 My homemade soap used 23 oz oil/fat, which this helpful conversion page tells me is approx 733 ml. Without bothering to look at each oil separately, that quantity of olive oil costs £2.38 at Tesco prices. Caustic soda costs £2.50 for 500 g at Boots and I used 3 oz, so that's... [can you hear the cogs whirring?]... 42.5p, making a total of £2.81 for the whole batch of soap. I used one twelvth of that for my bottle of laundry liquid, so that's 23.4 pence worth of soap. Not forgetting the soda crystals @ 92p/kilo, or 6.5p for the 2.5 oz I used, that makes a total of 30p for the bottle of laundry liquid. This compares favourably with the £4.30 we'd pay for the stuff we used to buy, I think you'll agree! Our electricity provider has sent us a new toy to play with: A free gadget that measures and displays our electricity usage in real time. I'd been thinking of buying one of these, so I was very pleased to get one for free, but I did wonder why they'd do that. After all, the main purpose of the gadget is to help us reduce our electricity usage, which is not exactly in their interests. Reading the small print, I thought I'd found the answer, "We reserve the right to monitor your usage, including time of day usage." (I should explain that the thing comes with a link-up to online software). Decent time-of-day usage data are highly valuable to an electricity provider, so they can optimise their output. I've been very interested to see how much power different things use. The fridge and the central heating pump are our main 'background' users of electricity, taking 100-200 Watts each, but not all the time. I was relieved to see that the laptops use very little - about 40 Watts, and again, not all the time. Right now the monitor is displaying zero, although I have the computer plugged into the mains. This big users are predictable, but still startling. We all know that electric kettles use a lot of power, but seeing the monitor shoot up to 2.5 kW is a striking reminder of that fact. I'm sure it's going to encourage me to heat less water (so it's on for less time) and to make the tea straight away, so I don't have to reboil. The washing machine also uses kilowatts, but I'm not sure I'm ready to switch to hand washing just yet. The real biggie, though, is the shower. We have an electric shower which is pathetically feeble, yet still manages to use 7.5 kW, and we use it for much longer at a time than the kettle. We really must crack on with those solar panels! As well as power consumption, the monitor has a built in thermometer and displays the temperature. At first, I thought this was an added bonus. Most lists of tips for saving energy include advice to turn the thermostat down a degree or two, so a thermometer fits with that approach. However, this one is slightly different. The accompanying booklet informs us that a temperature "below 17°C is considered too cold for healthy living," and "If flashing it is below 13°C, please turn your heating up." This thing is geared up to tell us to increase our heating, but will never tell us to reduce it. *We do keep our house cool but I have to agree that, even allowing for the two-degree error, 13°C is on the chilly side. This is because our central heating has broken, but that's another story. It worked! I've now washed my hair in plain warm water three times, spending less time over it each time and washing every other day, as I used to. It got less horrible each time, as the build-up of hair serum was washed out. Now I'm really happy with it! As an added bonus, my eternally flat, lifeless, dead-straight hair has bounce and volume, and even a bit of wave. Oh, and it doesn't tangle. I can leave it to dry without brushing, then it brushes out fine when it's dry. One caveat is that ends seem a bit dry. I may be willing to concede at this stage that a comb is not the best tool for spreading serum along the length of the hair, especially now there's so much less of it to spread. Perhaps it would be a good idea to buy myself a natural bristle brush after all. Now my hair's nice enough to stick with the no 'poo regime, it seems worth the investment in a new brush. A couple of updates here, as I left these two projects hanging, blogwise. Towards the end of January I gave in and started using my very first homemade soap. Here it is, next to the remains of the Imperial Leather. Don't you just love our beautiful basin? Our loo and shower tray are the same colour. ... I still have six bars for myself, which could well last until next Christmas. The marmalade wine was ready at about the same time as the soap, i.e. end of January. At least, some of it was ready. I had it fermenting in various different sized bottles, and the smallest one finished first. I tried some, and it was OK... I tested it on visiting in-laws, and they liked it too - enough to accept refils, so I'm fairly sure they weren't just being polite (though they are, of course, very polite people). Really - I was expecting it to taste 'interesting', which it certainly does - but it is surprisingly drinkable. There's definitely a bitter edge to it, from the bitter oranges, so it's not like other wines. Apart from that, it's not particularly orangey... I don't think I'd make a very good wine columnist, but you get the general idea. I like it. I gave away a couple of bottles as birthday presents (to people who like trying new and unusual drinks) - I hope they liked it too. This batch is a fair bit stronger than the earlier bottles. Judging by its headache-inducing effects, there may be some methanol in there, too. I can't have more than a glass in an evening, and even then I feel the effects the next day. That's really not good, is it? Hmm, better do something about that. Putting the old sugar thermometer to good use. I looked up the boiling point of methanol, in Farenheit because my thermometer is very old (149°F, in case you're interested), heated the rest of the wine to somewhere near that temperature, and kept it there for half an hour or so. I meant to leave it for about 15 min, but got distracted and left it rather longer. I probably lost some of the ethonal too, but I think there was some to spare. I'm drinking a glass or two this evening, so I can let you know tomorrow whether the heating was effective. Either way, it still tastes pretty good. Friday update: Yay! No headache this morning! I wonder if that's why I've been feeling a bit rubbish this week? I've been poisoning myself. Oops. Being generally befuddled by the range of contradictory advice on when to stick seeds in the ground, I was interested to see an article on moon growing in this month's Grow It magazine. The editor's comment also rang true - "The date of the last frost, summer rainfall expectations and the strength of prevailing winds meld into the tapestry of influences that dictate what we grown and when we grow it. So the idea of adding another factor into the mix isn't instantly appealing." On the other hand, faced with different advice from different sources, maybe another factor could be the deciding one. I'd heard of gardening by the moon before and been intrigued by it. It sounds rather like New Age mumbo jumbo, but the moon clearly does influence water levels here on earth, in the form of tides, so it's plausible that it could influence plants too. The article reported on a year's experiements conducted by the author, comparing a vegetable bed in which all the activities (digging, composting, sowing, harvesting, etc.) were carried out on appropriate days, according to the moon calendar, with a similar bed in which the same activities were carried out on what should have been exactly the wrong days. The results were impressive, at least for peas, beans and potatoes. As peas and potatoes are two of my main crops this year, this is good enough for me. Naturally wanting to avoid spending money, I looked online for free information and found the reassuringly mainstream-looking Gardeners Calendar. Rather than reducing my confusion, this increased it by having three different systems; synodic (phases of the moon), biodynamic (zodiac signs, following Rudolf Steiner), and siderial (more zodiac signs, but different recommendations). The website firmly refrains from recommending one system over the other (or indeed moon gardening at all) but suggests starting with the synodic system whilst learning more about the others. This seemed like good advice, but I was bothered by the contradictions between the three, so started my learning with a visit to Wikipedia. Weeds are combated (besides the usual mechanical methods) by collecting seeds from the weeds and burning them above a wooden flame that was kindled by the weeds. The ashes from the seeds are then spread on the fields, then lightly sprayed with the clear urine of a sterile cow (the urine should be exposed to the full moon for six hours), this is intended to block the influence from the full moon on the particular weed and make it infertile. This stuff is witchcraft! Apologies to any Wiccans, but really, this sounds like the kind of nonsense that gives witches a bad name. So much for the biodynamic system (and because of its similarity, the siderial system, too). What did the author of the Grow It article use? She refers to a book called In Tune with the Moon, which a little research reveals she also wrote*. Rather irritating that she failed to mention this in her article, but ho hum. It doesn't undermine her results, if she reported them honestly, and why should I mind that she's an expert on the subject, rather than a merely an interested gardener? *Edit - she's not the author, she's the marketing manager for the publisher. That makes me even less keen on her. Links from the In Tune with the Moon webpage to pages on Biodynamic growing raise suspicions. I don't want any of this wacky nonsense, I want the kind with empirical evidence! Oh, hang on, they're the same thing. Am I a scientist, open to whatever the evidence says, or a dogmatist, who simply refuses to believe that exposing the urine of a sterile cow to the light of the full moon is going to have any effect on the ground elder? I really don't know what to think. In addition to considerations of rain, frost, etc., I now have several guides to planting based on the position of the moon, some of which come with a hefty side helping of hocus pocus. I'm more confused than ever! My back aches, my hands are sore and filthy, and I'd like my fingernails back now, please. Some digging is hidden by the bush on the right, but it's there, I assure you. I don't know what they are, but they're massive. They took a lot of digging out. I put some of them in the Bed on the Edge and some down by the railway line, in an attempt to discourage next door's builders from churning up the grass there every time they turn round (it didn't work). Once I'd dug out the massive bulbs I turned that part of the garden into the first asparagus bed. I'll come back to this, as I've pictures of the second one. While I was in London on Tuesday, the rest of my fruit trees were delivered, which was very exciting. This meant a move away from the asparagus beds on Wednesday, to dig over the bits alongside the path where I want to put the trees. I'd already done the Bed on the Edge, but not the other side. The reason I hadn't done it was that I had to extend the bed first. To put it another way, I had to dig up some of the path. So I did. That's three similarly big holes in the ground, all with solid rock at the bottom. At this point, even I conceded that I'd have to put my Bardsey Island apple tree somewhere else. I think I might have dug down to the stuff the hill is made out of. If I dug that out, there might be no hill left! I then had to think about where to put the tree instead. The obvious place - indeed, the only place I could think of - was the other side of the path. This became one of those jobs that created a whole chain of other jobs. The rock at the bottom of the apple tree hole begat extending the bed on the other side of the path, which begat surfacing a new path, which begat finishing the asparagus beds on either side of the new path, so I wouldn't be chucking soil all over the newly surfaced path. Step 2: Place turves upside down in the bottom of the trench. Step 3: Throw some compost over the top of the turves. I didn't take a picture of this because I was so disgusted with the substandard compost I was sold by a door-to-door compost saleswoman. She told me it was horse manure, but it was mostly peat. I was diddled out of good honest muck! Step 5: Fill the trench with soil. That took a while, then when it was finished I moved onto making the new path between the two asparagus beds (these are the first two beds of four, by the way). First, gather up stones that I'd dug out of the big, rocky holes, and spread those on the new path. Then shift a few barrowloads of old path (small stones) dug up while extending the bed at the top of this post. I say a few barrowloads - the stones did all fit in one barrow, but I couldn't move it, so I had to shovel them into another barrow in smaller loads.